A fast-paced real-time strategy game that feels great with a controller. What is it? A brisk, streamlined RTS designed for a controller. Many developers have tried to hammer their real-time strategy games into forms that work well with a controller, but few attempts have led to something that could compete with those built around a mouse and keyboard. The latest, Pocketwatch Games’ Tooth and Tail, bucks this trend by not trying to be something it isn’t. It embraces the controller rather than treating it like an obstacle. A revolution is taking place in a land of talking critters. 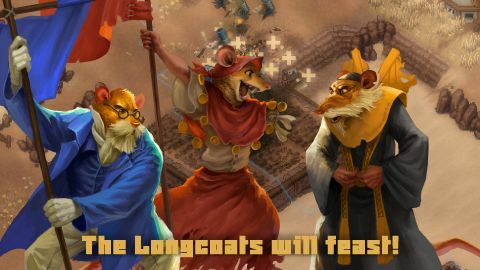 Tooth and Tail’s lavish, pixel art world calls to mind a mix of Animal Farm and Redwall, as adorable animals become embroiled in a bitter political and class war. Ostensibly, the Longcoats, Commonfolk, KSR and Civilized factions are all fighting over meat, but underneath that are a whole lot of grudges and bigotry. Leading the war, dragging all of these cute squirrels and owls to their deaths, are a group of charismatic generals. These leaders are your window into the world, chatting away to their troops and pals in the pre-fight hubs that flesh out the civil war in the campaign. They’re the only characters you’ll ever directly control, too, deftly sidestepping a great many of the problems associated with controller-based strategy games. Instead of evoking the likes of Halo Wars and other controller-based real-time strategy games, Tooth and Tail shares more similarities with Pikmin and Little King’s Story. These leaders can plonk down buildings, order troops to retreat, move to their position, or attack specific enemies, and scout the procedurally-generated battlefields. Generally, the random maps are a good thing, mixing things up and making repeat attempts at campaign missions a little different, though the procedural generation does occasionally cough up an unbalanced or hard to read map. The only thing leaders can’t do is fight, though they’re good at escaping dangerous situations. There’s no finger gymnastics involved, whether you're playing with a controller or using WASD and a mouse, as an order never requires more than a single button press. Even unit building has been simplified, as each 'warren' you build allows you to field a specific number of units, and will keep replenishing your army as long as you’ve still got food and not reached that limit. This means you don’t need to keep queuing up build orders, letting you focus on fights rather than admin. Instead of evoking the likes of Halo Wars and other controller-based real-time strategy games, Tooth and Tail shares more similarities with Pikmin and Little King’s Story. Commanding troops in particular should be familiar if you’ve played either game. Move your commander toward enemies (think of the commander as the cursor in more traditional RTSes), and press a button to rally them around you, or hold it to have them focus on a target. It feels great, removing a lot of the micromanagement that simply isn’t possible, let alone fun, if you’re not using a mouse and keyboard. But Tooth and Tail is much faster paced, and its battles both larger and more aggressive, so there have been times, during the most chaotic brawls, when I wished I had more fine control over my army. Tooth and Tail doesn’t really do precision. When you order units to attack, for instance, you’ll automatically select the nearest enemy or structure. You’re less a commander, sometimes, than a flare. And if you, say, want to split your long-ranged artillery ferrets into two groups so they can attack from two different sides, you’re out of luck. You can only select all of your units, or all of one type of unit. It’s disappointing when you can’t pull off something so simple, but in fairness, it rarely comes up. The broad range of units means that there are still plenty of common sense tactics that can be employed, and even more in co-op. When assaulting a base, for example, you may want to start by getting your ferrets in range to take out the defences; then send in infantry, perhaps brave but fragile squirrels, or maybe stealthy chameleons, to take out anti-air units; and then finally you can bring in some deadly owls, backed up by healing pigeons. Most units only have a single ability, but that also makes their roles very clearly defined. The challenge is keeping on top of all of your furry soldiers amid these often messy scraps, making sure they’re in the right position and don’t need to fall back, and, of course, ensuring that you’ve got the right tools for the job, from kamikaze frogs to flamethrower-wielding boars. Then there’s the additional wrinkle of trying to keep your pacifist general alive. They’ve got a lot of health, but with a focused attack, that goes down rapidly. It makes every battle exciting and kinetic, forcing you to keep moving, keep changing targets. Starvation is just as serious as a bullet. In battle, there’s only really one other concern: food. Every building and unit costs food, and ultimately it’s the catalyst for this whole revolution. There are few, if any, other real-time strategy romps that are so driven by a single resource. Even in objective-based battles, food remains king, and controlling it is the key to victory. Food is supplied by gristmills, around which farms may be constructed and then worked on by pig farmers. But both the gristmills and the farms are vulnerable to enemy attack and takeover, and each field rather quickly becomes fallow. There’s a hard limit to the amount of food that may be generated, then, and it’s reached quickly. With this in mind, starving your opponent is not only a viable strategy, it’s a key one. When they run out of food, they’re done for, unless they can escape the jaws of death with a last minute assault on one of your gristmills. Not only does this keep matches nice and brisk—they rarely go over ten minutes—while providing an alternative path to victory, it’s cleverly tied to Tooth and Tail’s themes, as well as simulating a real concern during times of war. Starvation is just as serious as a bullet. It’s novel to see a developer actually turn a resource into something that does more than just limit production. Novel sums up Tooth and Tail, on the whole, rather effectively. It’s unlikely to draw many away from their chosen traditional RTS, but it doesn’t need to. With its rapid battles, low barrier for entry and couch or online co-op, it’s the sort of thing that’s great to pick up and play on a whim.